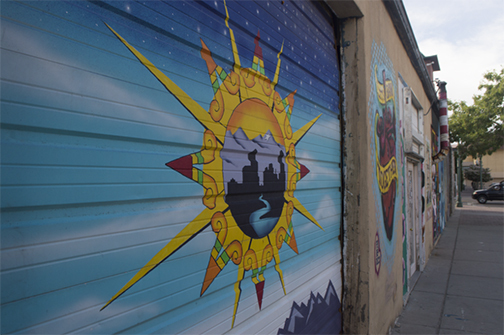 Many murals in El Paso reflect what it’s like to live in a border city and the struggles and pride that come from it. Pops of color have slowly been introduced into Downtown El Paso as artists have made this concrete jungle their canvas. “Art to me is an expression of who you are in the inside. To me, art started as a way to express myself and to build upon the experiences I’ve had through my life,” Leslie Grey said. Grey is an artist known for makeup and her contributions to local street art. Grey, a native El Pasoan, has pursued her dream of becoming an artist in her hometown. Grey is one of many artists who uses downtown as their gallery. As the vivacious colors of the murals in downtown, attract the attention of many. Cosmetologist, Sally Sue frequently walks around with her son in Downtown El Paso, she admires the art around her. Sue is one of many El Pasoans who appreciate the art and culture in downtown El Paso. Apart from those who appreciate the art downtown, local artists, like Dave “Grave” who Herrera who create it. Herrera works a Hotel Indigo. At the entrance of the parking garage at Hotel Indigo, a bigger than life stamp of an alligator and a hummingbird with a bright pink ‘paper picado’ background, “Loving Lagartos” greets visitors. “We placed it on an empty space in the hotel. It demonstrates a home away from home. The alligator represents downtown saying “welcome” to anyone who visits, the bird represents people that work downtown and the surrounding art is similar to a letter stamp” Herrera said. Herrera hopes hotel visitors will share the photo with loved ones. “People take pictures and send it to their loved ones to say, ‘hey, I’m downtown,‘ “Herrera said. Herrera has made many El Paso walls his canvas. One of the most notable was completed with the intention of showing justice and to fight for what you believe in. “I collaborated with my good friend, El Mac to work on this mural. It’s based on the story of a man named Melchor Flores, who’s been fighting for justice and answers for his son who was abducted by the police in Nuevo Leon in 2009,” Herrera said. “The mural, ‘Animo sin Fronteras’, took about a week to complete and represents the motivation of the blue collar members of downtown. Without them, Downtown El Paso wouldn’t be the sustainable area that it is. It represents all the hard working people in downtown that make it and fight everyday. Without them, you wouldn’t have a sustainable area because they are the backbone… This mural is for them,” Herrera said. Journalism in July is a workshop for high school students interested in studying journalism sponsored by the Dow Jones News Fund, and Borderzine.com. The Dow Jones News Fund sponsors the annual training based at the University of Texas at El Paso campus.